It only took 5 songs and a little over 45 minutes of music for Miles Davis to create one of the most groundbreaking and influential jazz albums of all time. Revered as a classic masterpiece of not only jazz, but of all musical genres, Kind of Blue is one of those landmark albums on the musical map that audibly defines where a different path was chosen and a new road was laid out. 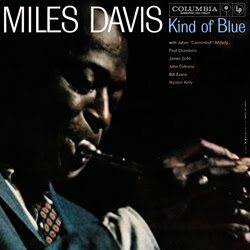 Where Miles’ previous albums had been based on jaw-dropping musicians soloing over complex chord structures, Kind of Blue was based around improvisational playing within the bounds of particular musical scales. It’s the difference between being handed a paint-by-numbers piece of art and choosing what colors go into it or being handed a paint palette of specific colors and choosing what to do with them on a blank canvas. Improvisation has always been a foundational element of jazz, but Miles took it in a completely different direction for Kind of Blue. The album was impressively recorded in just two sessions, one day for side one and one day for side two, and there was virtually no lead-up practice and no sheet music. Right before they started recording, Miles just handed the musicians a bare bones road map of which scales could be used for each song and gave a loose interpretation of what the song should do. Then, they just played; intuitively, instinctively and spontaneously. All six backing musicians were top-notch players and all had successful careers as bandleaders and sidemen. For the musicians, it was just another session. But everyone who has heard the album since its release knows better. Kind of Blue was not constructed, it was captured; like an audible photograph of music just “being” in its natural habitat. If you want to just listen to some jazz, there are plenty of fine albums to pick from. But if you truly want to experience jazz, you must start with Kind of Blue. Record Store Day news from Third Man Records! My Part-Time Cover: "Always On My Mind"